Have you ever heard of a rechargeable mirror? Well neither had I until I visited P&D Heating and Bathrooms enticing showroom recently. That is just one of the exquisite new bathrooms accessories and bathroom suites they have on display. The rechargeable mirror allows you to plug in your razor or other device into it and it will charge it for you. This clever product does function as its usual purpose as a mirror too. Procelanosa tiles are loved by celebrities like George Clooney, Nicole Kidman and Annie Lennox. These black and white striped tiles look magnificent in any bathroom. For the month of June only you can buy these upmarket tiles for only £23 a square metre. This is a saving of £5 a square metre. Maybe you want to change your basin units instead. The beautiful Roper Rhodes designer vanity basin units look spectacular too. Choose from 6 different designs. All the bathrooms P&D Heating and Bathrooms install though are of the highest quality. The team are always adding new pieces, so keep an eye on this blog for more information. Plans are afoot to build a working boiler in the upstairs of the showroom. Again, this is something unique to P&D Heating and Bathrooms but is a really nifty idea. P&D Heating and Bathrooms keep all their work in house. They don’t outsource anything to other companies. They design, install and fit all the bathrooms and boilers themselves. P&D Heating and Bathrooms only have a small team of plumbers and engineers but are very experienced with what they do. Not only that, they’ve got a new logo on their vans too. See above and below this blog for the pictures. 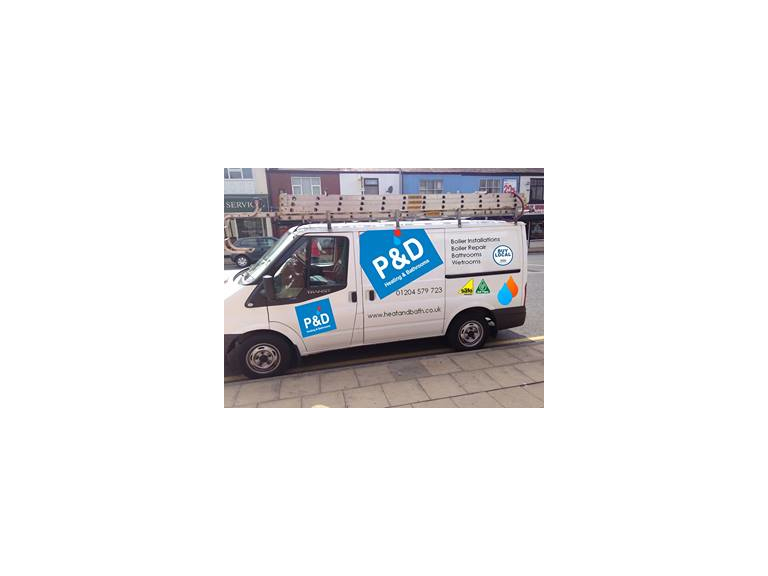 On the side, front and back of the vans is the bright blue and white logo of P&D Heating and Bathrooms. Plus it’s got the bestof Bolton, Gas Safe and OFTEC logo on it.